ELECTROLYTIC THEORY OF THE NEURON. in a series of web pages to be augmented by a series of individual guides. The GUIDES will be accessible to the left. The mammalian (including the human) heart consist of cells unique to the physiology of animals. While the cells have traditionally been described as myocytes, they incorporate all of the capabilities of a neuron as well. Therefore, they are more properly described as neuro-myo-cytes to highlight their actual features. In this work, the shorthand, cardiocytes, will be used to describe these cells. The neural aspects of the heart have frequently been labeled a mini-brain. In fact, it represents a mini-neural system. It contains all of the functional elements of both the central and peripheral nervous systems. It will be shown that the "mini-brain" of the heart does incorporate all of the capability of the central nervous system. It even contains a unique stage 8 element not normally included in the primary neural system. The heart operates independently, with only limited control through the autonous neural system. In the absence of such control signals, the heart will function normally for an indefinite period (limited primarily by nutrient availability and stable physical environment). The neural aspects of the heart have traditionally been labeled the conduction system of the heart. This is an honorable but archaic designation. The neural system of the heart utilizes many forms of signal projection besides (beyond) conduction. The heart of mammals is built about a manifold plate that provides structural rigidity to the mass of tissue. The heart consists of two discrete two-stage pumps attached to the manifold plate. The first stages of each pump, the left and right atrial chambers are mounted on the top of the plate and the second stages of each pump, the left and right ventricle chambers, are mounted on the underside of the plate. The major valves of the heart are mounted in apertures in the manifold plate. The right side pump collects blood from the venous system and pumps it into the lungs for oxigenation. The left side pump accepts oxigenated blood from the lungs and delivers it to the arterial system. The atrial chambers are the first to contract. After their contraction is complete, the ventricle chambers contract. The neural subsystem of the mammalian heart is laid out according to the following figure from Boron & Boulpaep, 2005. The "pacemaker" for cardiac activity is found within the sinoatrial (SA) node. Signals from this node stimulate the contraction of both the atrial chambers. After their contraction, the atrioventricular (AV) node senses that contraction and begins the stimulation required for the contraction of the two ventricular chambers. The AV node is located near the manifold plate end of the right atrial chamber. 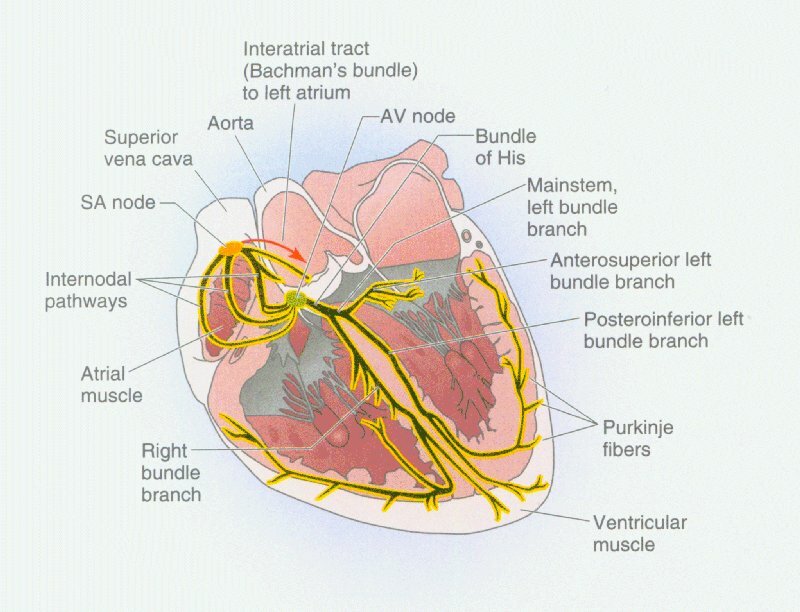 To begin contraction of the ventricles at their ends farthest from the manifold plate, it is necessary for the neural signals from the AV node to travel down the left and right branches of the Purkinje Bundle. The neural signals then spread out over the surface of the ventricles in order to stimulate a rhythmic contraction of each ventricular chamber. The neural paths are shown on a cross-section of the heart for orientation. Most of the signaling oriented cardiocytes are actually located on the outer surface of the heart. the first EXPLANATION of the interval-duration relationship defining the heart's operating cycle. Many phenomena previously uncharacterized, such as the shape of the wide variety of electrolytic waveforms recorded from the functioning heart and the interval-duration phenomenon, become quantifiable and a large group of new performance descriptors become available. Any photographs displayed on this site are for educational use only. Any commercial use requires written permission from the appropriate copyright holder.